About 15 years ago, I coined the common-sense phrase: 'dissimulated closed/rigged -market swindle,' as a brief overall formulation of what are popularly known as: Ponzi schemes, pyramid frauds, money circulation games, chain-letter scams, etc. However, although a few commentators have adopted my term, legalistically there is no such thing as a 'dissimulated closed/rigged-market swindle.' That said, it is universally accepted that lying to, or withholding key-information from, people in order to take their money, is fraud which is a form of theft. Common-sense also reveals that, by passing any law, but failing to enforce it, has the effect of authorising the very crime which you were apparently trying to prohibit. The lie which is fundamental to all 'closed/rigged-market swindles' is that people can earn income by contributing their own money to participate in a profitable commercial opportunity which is secretly an economically-unviable fake, due to the fact that the alleged opportunity has been rigged so that it generates no significant, or sustainable, revenue other than that deriving from its own ill-informed participants. For more than 50 years, 'Multi-Level Marketing' racketeers have been allowed to dissimulate closed/rigged-market swindles by offering endless-chains of victims various banal, but grossly-over-priced, products, and/or services, in exchange for unlawful losing-investment payments, on the pretext that 'MLM' products and/or services, can then be regularly re-sold for a profit in significant quantities. However, since no gang of 'MLM' racketeers has ever proved that products/services have actually been regularly re-sold to the general public for profit in significant quantities, 'MLM' participants have, in fact, been peddled infinite shares of their own finite money. In the final analysis, other than their ephemeral external presentations, internally there is no real difference between all closed/rigged-market swindles; for any alleged opportunity to make money, wherein (when challenged, and/or rigorously investigated) the promoters are unable immediately to provide independent quantifiable evidence to prove that their alleged viable commercial activity has had any significant, and sustainable, source of revenue other than its own losing participants, is self-evidently a fraud. Bearing the above in mind, often, I don't know whether to laugh or cry when I read the mainstream media's reporting of 'pyramid schemes' (only after they have run their course and collapsed). Readers are reminded that, for decades, some of most pernicious dissimulated closed-market swindles, or pyramid schemes, in history ('Amway', 'Herbalife', 'Forever Living Products', etc.) have been allowed to flourish in the UK without any rigorous challenge from mainstream media or law enforcement agencies. Readers are also reminded that lying to, and/or withholding key-information from people in order to take their money, property, etc., is fraud which is a form of theft. Hazel Cameron leaving Bristol Crown Court after pleading guilty to charges of operating and promoting a £21 million pyramid scheme. Susan Crane (left) and Mary Nash leaving Bristol Crown Court after pleading guilty to charges of operating and promoting a £21 million pyramid scheme. Six 'respectable,' middle-aged British women, Hazel Cameron, Mary Nash, Susan Crane, Carol Chalmers, Jennifer Smith-Hayes, Laura Fox, have been convicted of operating and promoting a pyramid scheme in which at least ten thousands persons (mainly vulnerable women) lost their money. More than a year ago, I was contacted by certain angry individuals whose lives have been wrecked by this particular fraud. However, until this week, no one has been allowed to report these matters due to the ruling of a Judge. Interestingly, although this a relatively straight forward example of a dissimulated closed-market swindle (in which the victims instinctual desires were manipulated in order to peddle them infinite shares of their own finite money), it has taken three separarate trials, and finally a guilty plea, to re-establish the rule of law. However, UK trade regulators accept that this case is just the tip of a growing iceberg comprising countless, similar pyramid frauds. Following a Competition and Markets Authority (CMA) prosecution, over three trials, nine people have been convicted at Bristol Crown Court of organising and/or promoting a pyramid promotional scheme involving over £20 million pounds. ‘As the convictions make clear, pyramid selling schemes where money is generated primarily by recruiting new people to join in, are illegal and criminal. Anyone thinking of organising or promoting such a scheme risks a criminal record and a spell in prison. The so called ‘Give & Take’ scheme (G&T) began in 2008 and was an unsustainable money pyramid promotional scheme that needed ever increasing numbers of new members – each paying £3,000 -to keep it alive. It involved around 10,000 people - mainly from the South West of England and from South Wales – with the majority losing their money. The scheme was brought to a close between January and April 2009 with the arrest of committee members from the Bristol area, who ran the G&T scheme, and of other significant promoters of the scheme. Charges were subsequently brought by, the CMA’s predecessor, the Office of Fair Trading (OFT), against eleven defendants. Bristol City Council’s trading standards service first referred the case to the OFT in 2008. A detailed investigation followed, with the OFT working closely with enforcement partners, including the South West Scambusters Team (a specialist regional trading standards team) and Avon & Somerset Constabulary. The case saw almost 300 witness statements taken and over 5,000 items of material seized and examined. The prosecutions were the first brought by the OFT under the Consumer Protection from Unfair Trading Regulations 2008. Under these regulations, pyramid promotional schemes in which the money for payments is derived primarily from introducing or enrolling others into the scheme, are automatically deemed to be unfair commercial practices. Establishing, operating and promoting such practices are a criminal offence punishable by up to two years imprisonment. The defendants were split into three trials – the first taking place between April and July 2012, the second taking place between May and October 2013, and the third was due to commence in September 2014 – with the results subject to a reporting ban until the conclusion of the third trial. Laura Fox, instigator of the 'Give and Take' fraud. At the first trial, the Chair of the committee and figurehead of the scheme, Laura Fox, and two other committee members, Carol Chalmers and Jennifer Smith Hayes, were convicted unanimously by a jury and each sentenced to nine months in prison. At the second trial, a jury were unable to reach full verdicts. Before the start of the third trial, a further three committee members - Susan Crane, Mary Nash and Hazel Cameron - pleaded guilty to the offences of promoting and operating the scheme, bringing the prosecution to a conclusion. Sentencing of these defendants has been adjourned to 13 October 2014. A further three defendants, Sally Phillips, Rita Lomas and Jane Smith, pleaded guilty before the start of their trials to offences of promoting the scheme, and were sentenced to prison terms of three, four and four-and-a-half months respectively, suspended in each case for two years. A further two defendants, Tracy Laurence and Rhalina Yuill, were acquitted. The G&T scheme relied on existing members recruiting others to join. It was organised into a series of small pyramids of 15 people. When eight new members signed up they were placed on the bottom row of the pyramid and paid their £3,000 joining fee to the person at the top, who was referred to as the ‘Bride’. The Bride received £23,000 (the remaining £1,000 went towards purported administration costs and to a charity of the Bride’s choosing). The pyramids would then be split with the two people below the Bride, the ‘Bridesmaids’, becoming the new Brides, with eight new people needed to join each pyramid. The scheme expanded exponentially this way so that, in theory at least, each member had the chance to rise to the top of a pyramid and net £23,000. The scheme had expanded to over 900 pyramids by the time it was closed. Participants were encouraged to invite their family, friends and colleagues to large promotional events where the cash payouts were awarded to the Brides. The events were designed to generate excitement around the scheme and give the impression that people would lose out if they did not join. The scheme was promoted as being within gambling laws. Although some of the organisers sought legal advice they did not reveal the full nature or changes made to the scheme when obtaining that advice. The organisers nevertheless continued to claim that the scheme had full legal backing. Although the scheme was targeted at women and promoted as being open to women only, men were allowed to join once the numbers began to dry up, as long as they used a woman’s name. The CMA is also continuing with action to confiscate defendants’ criminal assets under the Proceeds of Crime Act 2002. 1. The CMA is the UK’s primary competition and consumer authority. It is an independent non-ministerial government department with responsibility for carrying out investigations into mergers, markets and the regulated industries and enforcing competition and consumer law. From 1 April 2014 it took over the functions of the Competition Commission and the competition and certain consumer functions of the Office of Fair Trading, as amended by the Enterprise and Regulatory Reform Act 2013. 2. 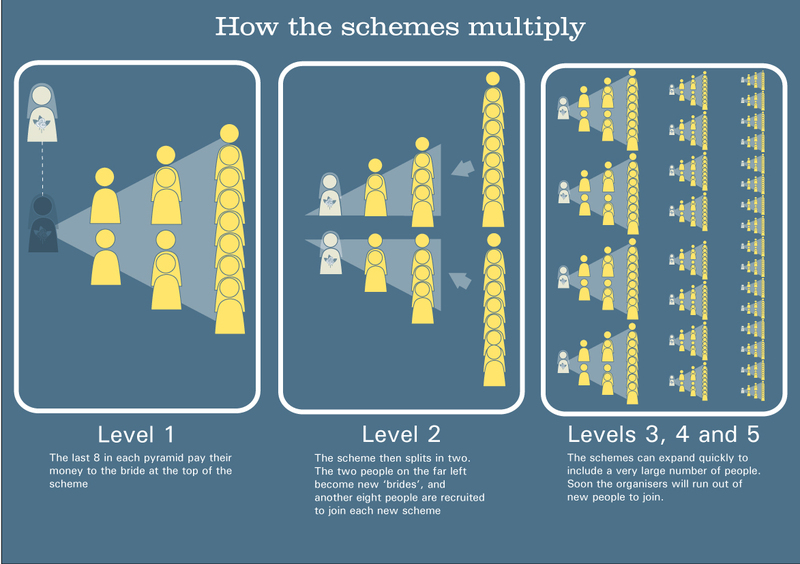 Pyramid promotional schemes are those where the ‘compensation’ for participants is derived primarily from introducing others, rather than from the sale of a product or service. Such schemes are automatically unfair commercial practices under the Consumer Protection from Unfair Trading Regulations 2008. They are distinct from promotional arrangements under which compensation payments are derived from the sale of a product or service. Unlawful pyramid promotional schemes may involve products or services but these will generally be overpriced and have no real resale value, the primary source of the compensation for participants being derived from introducing others to the scheme. Carol Chalmers - Venue Organiser. Hazel Cameron – Games Coordinator for G&T. 8. South West Scambusters targets rogue trading and scams across England and Wales, supporting all local authority areas in England and Wales. There are separate arrangements in place in Scotland. 9. Members of the public if they think they have identified a dodgy pyramid scheme or been a victims of an illegal pyramid promotional scheme should report it to Action Fraud: www.actionfraud.police.uk or call 0300 123 2040. Victims or groups of victims should consult a lawyer or other legal representative, including those at Citizens Advice, for help getting money back. The following article is from the 'Western Morning News' (September 18th 2014). A group of “greedy” women masterminded a £21 million get-rich-quick pyramid scheme which spread across the South West, it can be reported for the first time today. The group encouraged around 10,000 vulnerable women to “beg, borrow or steal” £3,000 to put into the scheme between May 2008 and April 2009. Victims were lured by the promise they would receive a £24,000 payout when they reached the top of their pyramid, with organisers promising they “could not lose”. The scheme, called Give and Take, quickly spread from Bath and Bristol to Gloucester, Bridgwater, Cheltenham, Torquay, Weston-super-Mare and Wales. Committee members behind the scheme pocketed up to £92,000 each, while as many as 88% of the women they recruited lost out – some up to £15,000. The scheme, also known as Key to a Fortune, was hidden under a veil of secrecy as members were banned from writing about it, Bristol Crown Court heard. But the pyramid was uncovered by authorities when a disgruntled employer in Bristol contacted Trading Standards to complain that it was being promoted in his workplace. Following two lengthy trials, in 2012 and 2013, three were convicted of the charges against them, three pleaded guilty, one was acquitted and two juries could not reach a verdict on another. A third trial – a retrial of three women a jury could also not reach verdicts on – was due to begin at Bristol Crown Court on Wednesday but the defendants entered guilty pleas before a jury was sworn. Reporting of the case was banned until the conclusion of all trials and lifted this morning following legal representation from the three women and the media. Judge Mark Horton will sentence the three women, charts co-ordinator Mary Nash, 65, committee secretary Susan Crane, 68, and games coordinator Hazel Cameron, 54, in October. Nash, Crane and Cameron all admitted operating and promoting the pyramid scheme. Chairman Laura Fox, 69, Jennifer Smith-Hayes, 69, and Carol Chalmers, 68, were convicted of operating and promoting the scheme during a trial in 2012. Fox, of East Harptree, Smith-Hayes of Bishopsworth and Chalmers, of Weston-super-Mare, were sentenced to nine months’ imprisonment. No verdict was reached following two trials of Tracey Laurence, 60, of Bradley Stoke, South Gloucestershire, while Rhalina Yuill, 34, of St George, Bristol was acquitted of promoting a pyramid scheme on her second trial. Judge Horton, speaking as he lifted the order today, said the public had to be aware of the dangers of pyramid and chain gifting schemes. “These cases and the actions and attitudes of these defendants demonstrate the way in which pyramid promotional schemes and chain gifting schemes can be secretly created and quickly spread amongst a vast number of people and over several counties,” Judge Horton said. Judge Horton said the scheme targeted vulnerable women who could ill afford to lose the money. “A number of these women suffered enormous and in some cases lifelong financial hardship due to their involvement in this scheme,” he said. Judge Horton said 88% of those who entered the scheme would lose their money. “It is important now that the full matter of risks of this type of scheme are exposed and made known to the public,” he added. During the trials, the two juries were told how the scheme operated around pyramid charts that had 15 spaces on. Each space was filled with a participant who paid £3,000 and introduced two friends, who also paid that amount. Once the chart was filled, the eight people on the bottom of the chart paid their £3,000 to the person on the top, called the “Bride”. Participants collected their winnings at specialist prize-giving pamper parties, where they would be asked a series of simple questions before being handed the £24,000. A set £1,000 fee from the payout was deducted, with £600 shared between charities and £400 used to pay costs the committee occurred. Miles Bennett, who prosecuted both trials, said potential recruits were invited to the parties at the Battleborough Grange Hotel in Burnham-on-Sea, owned by Carol Chalmers. The “champagne evening celebrations” were attended by up to 300 people, who paid £2 entry for games and drinks. Mobile phone footage recorded at one of the parties showed Laura Fox shouting: “We are gambling in our own homes and that’s what makes it legal. After games were played, the winnings were handed over to the Brides at the top of their charts in cash – with as much as £240,000 handed out in one evening. But Mr Bennett said the celebration evenings were a “commercial practice”, with the committee holding meetings and entrants writing their names on a signing in book before entering. Minutes from meetings show the committee required disposable cups for champagne and expressed concerns about attendees’ chewing gum. There was “sheer indignation” that a Bride expected to bring champagne to celebrate her payout had brought cava instead, Mr Bennett said. “What was being operated from May 26 2008 to April 29 2009 was a pyramid promotional scheme where people were invited to give £3,000 with the promise they would receive £24,000,” Mr Bennett said. “Wouldn’t it be wonderful if life was that simple? But it’s a bit of a scam. “It needs more and more people to be investing. To join a scheme you need two people who can in turn invest £3,000. “It is usually recognised that 12 to 18% are winners and 82 to 88% are losers. They simply do not work. Women were hooked with the promise of making £24,000 in just a few weeks for a £3,000 outlay. Hundreds of women were reeled in at a time at pamper parties held at a hotel run by one of the organisers. But what the unsuspecting women did not know was that they were being drawn into a scam where the vast majority would lose all their money – some as much as £15,000. The pyramid scheme operating in the Bristol case, known as Give and Take or Key to a Fortune, was a classic one. Schemes like Give and Take can destroy whole communities, who are seduced by the idea of a quick buck. They are often advertised through mail, the internet, recruitment meetings or through word of mouth, and work by promising huge earnings if members recruit others. In Give and Take, members joined by paying a fixed sum of £3,000 to head a syndicate of 15 people. The rules stipulated they had to recruit two friends, who also paid up and then it was their turn to recruit more members. Once the chart was filled, the eight people on the bottom of the chart paid their £3,000 to the person on the top – called the Bride. The participants collected the money at glitzy prize-giving parties hosted at The Battleborough Grange Hotel in Burnham-on-Sea, owned by Carol Chalmers. The celebration nights drew in crowds of up to 300 women, who sipped glasses of champagne and enjoyed a “girls’ night out”. Committee chairwoman Laura Fox gave inspirational talks about the Give and Take scheme telling guests “you can’t lose”. They would be asked a series of simple questions before being handed the £24,000 – an 800% profit in a matter of weeks. A set £1,000 fee from the winnings was deducted and shared between charities and used to pay costs the organisation occurred. There were also other fun games with cash prizes to reel in those who had not won the jackpot. But in order for every participant to make money, there needs to be an endless supply of newcomers. In order for the Bristol scheme to be sustainable, every man, woman and child in the UK would have needed to take part. The women were banned from writing about the scheme or those behind it. Some participants struggled to find enough people to fill their pyramid and broke the rules by sending emails to friends, family and colleagues – sometimes accompanied by pictures of winners in cash-filled bath tubs or perched on luxury motorbikes and cars. Ultimately only the original members made any money and the rest lost out. Prosecutor Miles Bennett told jurors at Bristol Crown Court: “This wasn’t a bunch of ladies sitting around playing bridge. This was a committee and Laura Fox ruled these nights with a rod of iron. “What was being operated from May 26 2008 to April 29 2009, was a pyramid promotional scheme where people were invited to give £3,000 with the promise they would receive £24,000. “It needs more and more people to be interested. To join the scheme you need two people who can in turn invest £3,000. “It is usually recognised that 12% to 18% are winners and 82% to 88% are losers. They simply do not work. The Office of Fair Trading estimates that pyramid scams collectively cost UK consumers £420 million every year. They estimate that 480,000 adults fall victim to these scams each year, losing an average of £930 each, but only one in 100 people report their experiences to the authorities. Often victims recruit family and friends to the scam, resulting in emotional as well as financial harm. Pyramid schemes are unlawful under the Consumer Protection from Unfair Trading Regulations 2008 that prohibit the establishment, operation or promotion of a pyramid promotional scheme. A father-of-four who invested into the Give and Take scheme has been struggling financially for the last five years – after he failed to receive a payout. Dave Gough, from Caldicot in South Wales, paid £3,000 to join the scheme in 2009 after being told “nobody would lose”. The driving instructor, who has four sons, never reached the ‘Bride’ payout position so lost his investment and is still paying it off. Mr Gough was initially dubious of the scheme but caved in after three months of persuasion and began to plan his future with his winnings. “It sounded absolutely fantastic, there was no way I was going to lose,” he told BBC News. “I was told it was backed by major solicitors and barristers in the Bristol area and it was all legal. Nobody would lose because the scheme would just keep going and going and going. “They gave the impression there was nothing illegal about it. There was no con, nobody could lose. Mr Gough said he began to make plans with his family for the £23,000 they expected to receive once he reached the top of his chart. “We thought were were going to get this money, definitely,” he said. Mr Gough issued a stark warning to others considering joining a pyramid scheme. “Four years on I’m still living with the consequences. There’s still an amount of that money that I’m still paying back now,” he said. “Obviously it affected my other finances, so for the last four years we’ve struggled and we’re still struggling now – all because of being conned out of £3,000. “Don’t do it. If it’s too good to be true, it is too good to be true. It’s a big con. It doesn’t matter if it’s your friends or relative, you stand to lose your money. “Some people will make some money from it but the majority will lose all their money. Another victim, Shirley – not her real name – was invited to a meeting at Laura Fox’s home through a neighbour who had won £23,000. At the meeting, Shirley watched as £69,000 in cash was paid out to three winners and heard a talk about how the scheme worked. She was told the scheme was legal and a barrister had drawn up a statement confirming this, as it was classed as in-house gambling. “I wasn’t sure about joining so I went to other meetings, where I heard the same explanation,” she said. “I spoke to a number of people about how the scheme worked and how long it had taken them to get their payouts. Shirley joined a chart in around June 2008 and paid £3,000 the following month, as well as £3,000 for two friends. Shirley never received a payout, meaning she lost £12,000, her partner £3,000, while a friend who also paid onto the scheme lost £3,000. Another victim, known as Liz, was introduced to the scheme by a work colleague, who sent a picture of herself receiving a payout of £23,000. “I was told to come to a meeting and see how it worked for myself,” Liz said. “At the meeting there was a presentation about the scheme and photographs of winners with their money. “I was assured my investment would be bought out if the chart I was on was struggling and I would get help to keep the charts moving. On the evening Liz paid out her first amount of money, she watched £184,000 in cash being paid to eight winners. Liz was so convinced by the scheme that she joined a second chart, handing over another £3,000. She then joined three more times, paying £9,000 more. Liz attended a meeting at Battleborough Hotel, which was so full that potential recruits were split into two groups for presentations about the scheme. Despite paying out £15,000, Liz never received any winnings. Norwegian regulators fail to identify the 'Lyoness' racket. 'Lyoness' is the name over the entrance to a classic blame-the-victim 'income opportunity' cultic racket, comprising a dissimulated closed-market swindle, or pyramid scheme, and related advance fee frauds. In the simplest terms, behind all the commercial/philanthropic camouflage and layers of linguistic/mathematical/economic hocus-pocus, the overwhelming majority of the money which has been flowing into the dark heart of the 'Lyoness' racket, has come from its never-ending chain of temporarily deluded core-adherents (based on their false-expectation of future reward). Over the past few months, Norwegian lottery regulators, led by Monica Alisøy Kjelsnes, have supposedly been investigating the activities of the organization known as 'Lyoness.' The result of these supposed investigations can only be described as astonishing; particularly, when you consider that the corporate front for the 'Lyoness' racket has been set up in Norway in such a devious way that Norwegian regulators could not access any audited accounts. Instead, they relied on unverifiable figures supplied externally by the 'Lyoness' Ministry of Truth. Thus, the Norwegian lottery regulators, led by Monica Alisøy Kjelsnes, have finally concluded that although 'Lyoness' has been the front for an illegal pyramid scheme in Norway, based on the organization's own figures, 'Lyoness' is no longer hiding such criminal activity and, consequently, will not be prosecuted. 'In the report the Norwegian Gaming Authority have concluded that Lyoness is not engaged in an illegal pyramid scheme in Norway today. 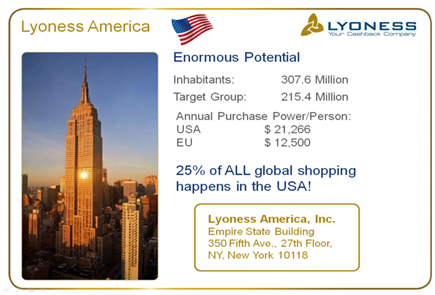 The reason for our conclusion is that we have received information showing that more than 50% of revenue from Lyoness business in Norway today comes from sales of goods and services and not from recruiting members and their participant payment. We see that Lyoness in an establishment period in Norway has had more than 50 percent of its revenue from recruiting members and not the sale of goods and services. However, the Authority considers that the Lyoness in the years 2012 and 2013 ran an illegal pyramid scheme in Norway where more than 50 percent of revenue in this period came from recruiting members. Since Lyoness currently operates legally we will not react to the violation. Predictably, I have yet to receive a reply to my common-sense question.